If you are a military veteran that needs legal assistance in the area of family law, you may contact one of the listed legal resources. The Bette & Wylie Aitken Family Protection Clinic provides free legal advice and representation to victims of family violence, including victims who are Veterans. The FPC primarily provides legal advice and representation to victims seeking Family Court protection orders or immigration benefits. The FPC primarily serves low-income and indigent victims. In addition to legal advice and representation, victims may receive advice and information on law and procedure by participating in one of our pro per protection order workshops. Domestic violence related services, including counseling, shelter, transitional housing, education, case management, and legal advocacy. Levitt & Quinn has a full-time staff position dedicated to assisting veterans who are homeless or low-income with their child support and other family law issues. Intakes are performed on a regular basis at various facilities for veterans. The services provided include advice, referrals, and direct representation in court. Levitt & Quinn also collaborates with community partner agencies to conduct educational trainings. 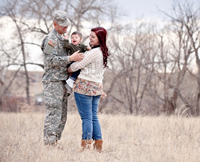 Family law issues are one of the most pressing facing veterans. The goal of this project is to remove barriers for transitioning homeless veterans into permanent housing and employments. Ultimately, this project seeks to reintegrate veterans with their families and increase visitation with children to create more stable families. It is anticipated that in 2013-2014, 250 veterans will be served through this project.